Earnings and stock technical information for NYSE: DUK investors and those interested in the company's financials. Duke Energy hotline information and staff resources with contact info for specific media inquiries. Meet Duke Energy's senior management working to innovate the energy industry. 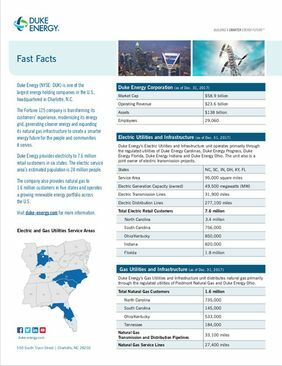 Access an up-to-date comprehensive list of Duke Energy media mentions including videos and articles.